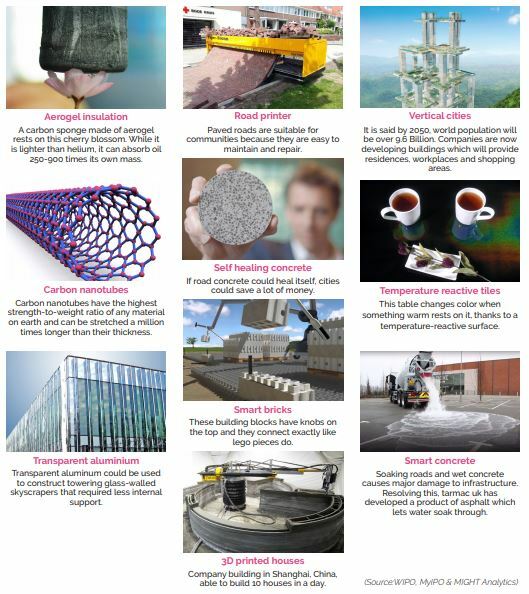 Technological breakthroughs in the not too distant future look set to reignite the construction industry’s growth. The emergence of new technologies is offering plenty of opportunities and creating new fortunes for the industry. In part, early promises of reduced operating costs and turnaround time are enabling greater flexibility in the areas of design and structure. This is making room for higher profit growth mostly welcomed by industry players. Now, construction companies can expand operations at amazing speed with these new technologies. Imagine a house built in only 24 hours thanks to a new 3D printing technology called “contour crafting” that reduces construction time by using a nozzle-equipped robot spewing out a flow of concrete mixture based on a programmed computer pattern. Some developed countries are already getting ahead of this game-changing trend and similarly, many large companies have followed suit. Using 3D printing, for example, Dubai recently announced that 25% of the city-state’s new buildings will be made using 3D printers by 2025. Currently, there are a lot of applied technologies being developed and soon, in line with the rise of the fourth industrial revolution (4IR), widely innovated construction methods will enable lower labour utilisation and considerable energy savings. This is a much needed break from the usual business as the 4IR will bring about a massive transformation. Given its potential, during recent World Economic Forum, Klaus Schwab said that the transformation was not only going to impact the industry but will also alter the way we live, work and relate to one another. All these innovation activities are fuelling several major changes especially in the way goods and services are produced, delivered and consumed. Technology is increasingly the source enabling growth. What is significantly different is the way it is playing out to be a transition where conventional manual approaches will be phased out with digitalisation and automation. Towards these goals, digitalisation is combining multiple aspects of data analytics, digital access and connectivity to create autonomous and self organising systems. In general, the transformation will impact the whole value chain, imaginably from design to onsite construction works and deconstruction. “Construction 4.0” is a branch of the 4IR. The term is used to refer to the digitalisation of the industry. The construction sector has a strong competitive edge, which by 2025, will be radically transformed when leading expertise in architecture, design and engineering grows more prominent. A number of large companies are already leading the way—offering sustainable solutions, such as reaching an unprecedented result in lowering greenhouse gas emissions by as much as 50%. This year, the global construction sector is expected to grow 3.6%. With new trends are taking over, the industry’s future looks more promising than it has ever been. Below are the top eight trends that appear likely to make the biggest impact over the next five years or so. BIM is a digital test mule that simulates the physical and functional characteristics of a building. The greatest case for BIM lies in the ability to make planning better and today, more and more contractors are using BIM to improve their work processes. Project management software Real-time project management software programs are improving and optimising the fundamentals of construction methods. Making a critical contribution in the building process, project management software packages enable data-driven decision making. These real-time software programs promote greater transparency, accountability and efficiency throughout the industry. Realistic and immersive, VR can demo a virtual walkthrough to sell a property or pitch architectural ideas to clients. In construction, it can be effectively used to provide safety training for construction workers. VR can also be used to improve lines of communication especially for tasks such as selecting parts in a warehouse or sending repair instructions over mobile phones. Mimicking real-world environment, AR devices overlay information, graphics or audio content through data and information. Construction companies can use AR to provide accurate measurements of building plans, building materials and frameworks to reduce the risk of errors and cut construction time. 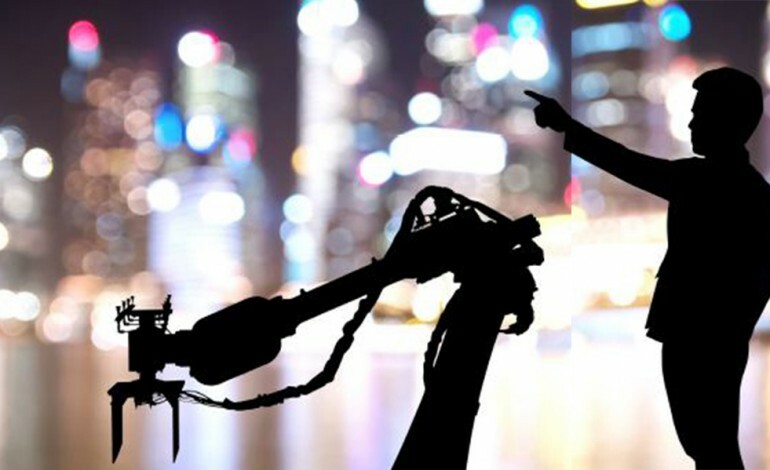 Robotics is constantly gaining ground in construction. The use of robots in the building process can accelerate the completion of repetitive tasks. However, robotics still has a long way to go but in the long run, it is expected to introduce a faster, cheaper and safer way to work onsite. Self-driving vehicles, masonry construction robots are some examples of the robotics’ arrival in construction. With large sites and assets to manage, the use of drones in the construction sector means a significant change in the industry. Drones can be used for a wide range of purposes such as communication, safety and marketing. Drones offer numerous advantages for construction applications (e.g. site mapping and inspection, reporting, client updates and project monitoring.) To illustrate, drones can reduce the need for engineers to visit sites, while at the same time increase the frequency of location checking. A modular building is the development of a building structure off-site, and then transported to the actual location without compromising on quality. It essentially moves 80% of the construction work off-site. Often used in combination, now, jobs on-site can be done in significantly less time. Industry observers estimate job completion turnaround time to be reduced by about 65 times faster. A green building by default is a building that’s designed, constructed and operated to reduce or eliminate negative impact to the environment. Quite possibly, green buildings could also contribute to a larger ecological footprint. On a similar note, green construction will attract a lot of attention. Construction managers and contractors will have to change their old ways and acquire the necessary capability to satisfy the most demanding and up to date green construction standards. In construction 4.0, the workforce composition is anticipated to change. The rise of digital technology demands a new pool of tech-savvy and competent workers to emerge. Undoubtedly, knowledge workers will be the future of the industry. In general, the construction industry has a great opportunity to update its profile and become an appealing option for young jobseekers who are after a long-term career in a technological environment. “Construction 4.0” and hold massive potential to go mainstream. The 4IR is believed to bring stronger results to the country’s economy. By exploring and accelerating the take-up rate of the 4IR technologies, Malaysia could improve its socioeconomic performance. To date, invention activities are focused on civil engineering, building materials and process work-flow for improvement. From 2008 to 2015, the number of patents registered has averaged 60.5 patents a year, while the decline in 2016 and 2017 stood at 35 and 10 patents, respectively. According to International Patent Classification (IPC), leading the charge is the general building category with 99 patents registered. 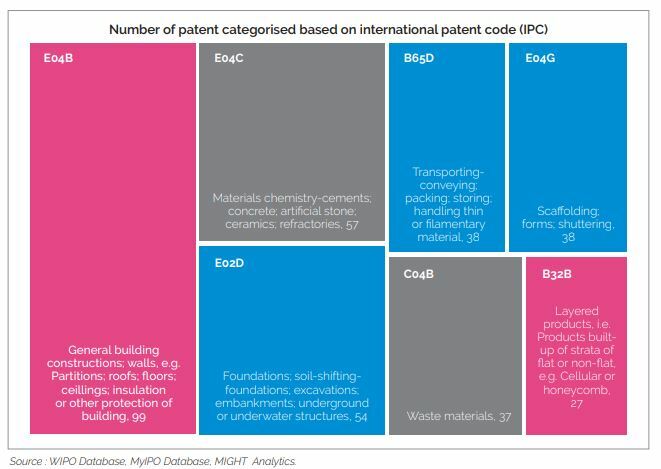 Meanwhile, 57 patents were registered for chemical materials, 54 patents for foundation, 38 patents each for transportation and scaffolding, 37 patents for waste materials, and last but not least 27 patents were registered for layered products. To revive Malaysia’s construction industry, there are a number of low hanging fruits that can be exploited. Studying trends led by other countries, invention and exploration on 4IR technologies are creating the platform upon which innovation operates. New inventions and innovations are making up a lot of ground in various technology platforms namely simulation, robotics, UAV and 3D printing. United States, China, Russia, Canada and Australia are among the front-runners with the most representations of 4IR patents accounting for 84, 39, 14 12, and 11 total patents, respectively. Further, the exploration of ground breaking 4IR technologies presents a great opportunity for the research and development in various technology areas. 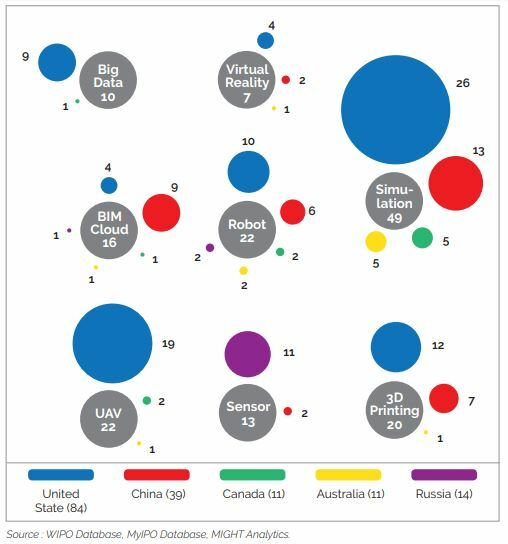 As the table suggests, simulation, robotics and UAV were the technology platforms that registered the most patents by top countries. In “Construction 4.0”, simulation will see more widespread application. Real time data and image processing will be used to great effect to mirror the physical world in a virtual model. This allows industry players more room to maximise machines, products and humans’ workflows. So far, the technology has exhibited the ability to drive down machine setup times. Soon, it will be used even more to identify bottlenecks, maximise efficiency and prevent occupational hazards. Onto robotics, the focus has been put on improvement gains across the construction process. This includes spraying, atomising apparatus, manipulating devices, advancing the use of optical systems and apparatus for major construction works. Meanwhile, invention activities around UAV have focused on the development of generic UAV features. These features cover radio navigation and recognition, presentation and data monitoring of which we are likely to see more UAVs at construction sites for maintenance and inspection works. future and will undoubtedly improve overall industry practices. The 4IR is inevitably here and it will bring great benefits to the industry at large. New technologies have a lot to offer and will lead to greater efficiencies. Now, city authorities, private developers and residents have at their disposal tools to better plan, visualise and manage urban development as well as operations. Over time, these technologies and capabilities will become much more cohesive to support intelligent work procedures and evidently, streamline the construction sector once again. Taking off globally, advances such as reduced construction costs and lower environmental effects from more efficient use of scarce materials are hugely beneficial in the long run. In its net effect, innovation and sustained development effort are the lifeblood of the revolution— and have the ability to narrow global infrastructure gap even further. In order to stamp the 4IR’s hallmarks, the construction industry needs to create new jobs, drive economic growth and provide a viable solution to address a host of formidable social, energy and environmental challenges. But unlike other periods of significant change, governments and the industry need to collaborate and rethink their strategies to deal with each country and market’s unique challenges. And in Malaysia’s case, it is the country’s ageing population. However, the issue is not just unique to Malaysia. Overall, industry players must thoroughly consider the evolving needs of the industry in end-to-end project management to draw on the 4IR’s emerging technologies. At least, that’s what conventional wisdom holds. The reality, though, is more complex as the takeup rate of new technologies is never fully aligned. Construction companies will certainly have to scour their operations for ways to boost efficiency to find an edge. The real challenge therefore lies in building “smarter”. Without question, the only way to achieve this is to embrace technology and productivity-enhancing innovations to improve decision making and work procedures. However, before we hop on the 4IR map, let’s get the fundamental right in the first place. It’s not just about building faster, taller buildings, but building smart for a sustainable shared future.